What you get in the box! Kitsune-youkai (pronounced kit-soo-nay yo-ka-ee) are Japanese fox-spirits, known for tricking unwary mortals. We’ve come to know them through traditional tales, wherein they do this for many reasons: purely for fun, to devour mortals or steal their souls, and so on. In this a game of luck and tactics, those who gain all nine tails of the mythical spirit fox earn their place among the kitsune elders. 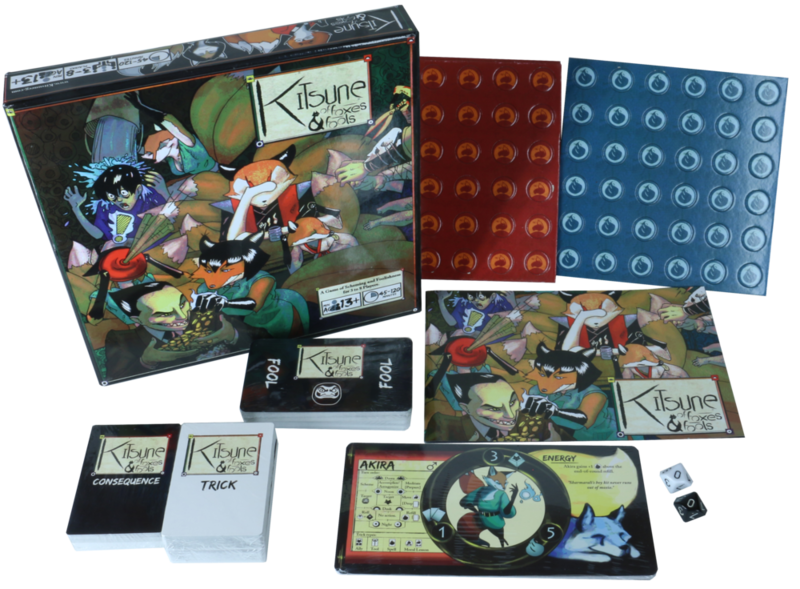 This card game is about kitsune-youkai chosen by Inari-no-Kami, who play tricks while scheming to punish mortal fools for their foolishness, sometimes teaching them a lesson in the process. By correcting mortal foolishness, the foxes earn their tails. Each player takes the role of a fox trying to earn his or her tails through impressive schemes. Some cards represent the foxes; others, the tricks they can play in their schemes, the fools to whom they must teach lessons, and the consequences that befall foxes who fail.